Nanomaterials Synthesis: Design, Fabrication and Applications combines the present and emerging trends of synthesis routes of nanomaterials with the incorporation of various technologies. 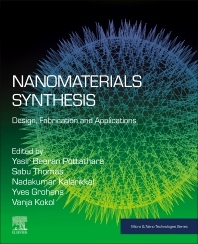 The book covers the new trends and challenges in the synthesis and surface engineering of a wide range of nanomaterials, including emerging technologies used for their synthesis. Significant properties, safety and sustainability and environmental impacts of the synthesis routes are explored. This book is an important information source that will help materials scientists and engineers who want to learn more about how different classes of nanomaterials are designed. Yasir Beeran Pottathara is a Postdoctoral Researcher at LIMATB, University of South Brittany, Lorient, France. His research focuses in the area of nanomaterials for energy storage applications. Professor Yves Grohens is the Director of the LIMATB (Material Engineering) Laboratory of Université de Bretagne Sud, France. His master's and PhD degrees were from Besançon University, France. After finishing his studies, he worked as assistant professor and later professor in various reputed universities in France. He is an invited professor to many universities in different parts of the world as well. His areas of interest include physicochemical studies of polymer surfaces and interfaces, phase transitions in thin films confinement, nano and bio composites design and characterization, and biodegradation of polymers and biomaterials. He has written several book chapters, monographs, and scientific reviews and has published 130 international publications. He is the chairman and member of advisory committees of many international conferences. Vanja Kokol is Associate Professor, Faculty of Mechanical Engineering, University of Maribor, Slovenia. His research focuses on chemo-enzymatic derivatization, modification and/or functionalization of biopolymers and organic/inorganic nanomaterials.